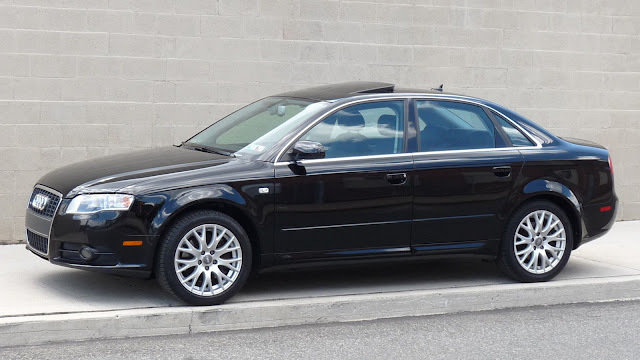 DT E-i-C Vince: I'm going to suggest a post 2000 era Volkswagen/Audi product, such as this 2008 Audi A4 with the 2.0T 4-banger here on eBay bidding on eBay for $4,050 with 4 days to go. These things are so well put together...although I'm not confident that Audi ever fixed their coil pack issues. Somebody asked if the Geo Metro had the best selling 3-cylinder engine ever, and my first thought was -- I'm pretty sure that award goes to the 1.8T (zing!). 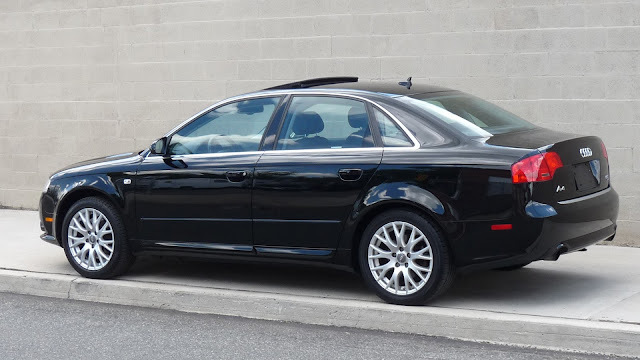 Anyway, if you want a car that isn't as loud as an old Volvo, I don't think you need to go full retard with a Prius -- just back it down a notch and get something post 2000 model year with a decent amount of sound deadening (not a Focus, for instance). What do you recommend for Zach? Comments below. Lexus LS 400? Here's a 142K mile 1990 with a lovely burgundy interior. Finally, a car that won't show all the vino that I spill while driving around! Future mileage accrual should generally be low on an annual basis up here - maybe 7,500 - 10,000 mpy max. What kind of life are these puppies good for? Mercedes W124. $10k will get you a primo sedan or wagon version. Definitely a couple notches up in refinement from your Volvo and Saab. Just make sure you pick one up with quiet tires and no gear whine. +1 for the W124 -- in fact, just about any of the pre-DaimlerChrysler era Benzes will do nicely, even the clickity clackity diesel versions aren't that noisy at speed. Have a friend who has the W210 version of that, it'll probably go forever. Servotronic PWM cube failed on the steering rack three years ago, no one sells just the MB cube you have to buy the whole rack at Wall Street Rental Girlfriend prices. Replaced it with one off one of my junkyard Cadillac Catera steering box just to see if it'd work, it's been on there ever since with no issues. I am about to mention the DT version of the anti christ... Toyota Camry... I had one with a V-6 in it and it was so quiet and comfortable that passengers regularly fell asleep. Or was it a carbon monoxide leak? You are restoring a Volvo Amazon, you are automatically DT worthy, so you can drive a boringmobile if you need to. As per Gianni - Lexus LS 4 door would also be a good choice for quiet and quality. Now THAT's a radical idea. Face it Zach, you need a car that will run when you go to the parts store for your other vehicles. Don't think of the Camry as a car (because it's not, in DT terms). "A mysterious device that gets you from A to B, and doesn't break down, or cost you money to run"
See? I told you...that is NOT a car! What the hell do you mean "we don't need three cars"?? What's the goddamn matter with you Zach? Of course you don't NEED three; you NEED five. Hard to argue against the LS for Best Actor in the Role of Tomb, though. If total auditory isolation is what she desires, I think you've found your wiener. I've grown weak, del, weak! Please, when taking all the testimony into account before handing down your sentence, remember that my newest car is a '95 - it's 21 goddamn years old, del! My oldest just turned 50! Fine. You razzled me with your numbers mumbo-jumbo and I need to go rebuild the MGB's window winder anyway. Or was it the master cylinder...? I don't know...something needs fixing on the MG. Because MG. Yes, that. At least 3 or 4 if there are two of you. The biggest thing you can do with noise is to get the right tires. Then a weekend putting in some strategic sound deadening will transform any car. That said, the quietest car I've had is probably an XJ8 but for 10k you could get a low mileage XJR, which is very fast indeed. Though honestly my c43 isn't that much louder in the cabin, it just rides harder which tends to translate bumps more. I've got some continental dw's on it and that helped a lot, they're pretty squishy in the sidewall.